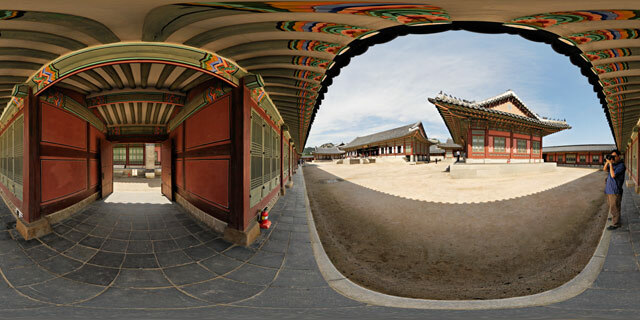 360° VR panorama by the gate in the southeast corner of Gangnyeongjeon Compound in Gyeongbokgung Palace, Seoul, South Korea. Looking into Gangnyeongjeon compound from a side gate, the large building in the center is Gangnyeongjeon Hall (강녕전; 康寧殿), the nearest building, to the right of the hall, is Yeonsaengjeon (연생전; 延生殿), and the building to the left of the hall is Gyeongseongjeon (경성전; 慶成殿). Yeonsaengjeon, Gyeongseongjeon, and Gangnyeongjeon were all originally built in 1395, the fourth year of King Taejo, founder of the Joseon dynasty and Gyeongbokgung Palace. The buildings were destroyed during the Japanese invasion of Korea in 1592, and then rebuilt in 1867. In 1917 the buildings were torn down for use in rebuilding Changdeokgung palace. The current buildings were rebuilt in 1995, as part of the Korean government’s 40 year initiative to rebuild the structures that were destroyed during the Japanese occupation of Korea. The first two characters of Yeonsaengjeon’s name, 延生 – yeonsaeng, mean ‘Breath of life’ (the last character, 殿 – jeon, just means Hall). Gangnyeongjeon was the most important building in this complex, containing the King’s bedchamber. The building was laid out in a checkerboard pattern, with seven chambers on either side of the central chamber, occupied by the King. The other chambers would be occupied by court officials. Gangnyeongjeon (Hangul: 강녕전; Hanja: 康寧殿), also called Gangnyeongjeon Hall, is a building used as the king’s main sleeping and living quarters. The building contains the king’s bed chamber and was first constructed in 1395, the fourth year of King Taejo. Destroyed during the Japanese invasions of Korea in 1592, the building was rebuilt when Gyeongbokgung was reconstructed in 1867, but it was again burned down by a major fire on November, 1876 and had to be restored in 1888 by the orders of King Gojong. However, when Huijeongdang of Changdeokgung Palace was burned down by a fire in 1917, the Japanese government dismembered the building and used its construction materials to restore Huijeongdang in 1920. The current building was rebuilt in 1994, meticulously restoring Gangnyeongjeon to its original specifications and design. Gangnyeongjeon consists of fourteen rectangular chambers, each seven chambers located to the left and right side of the building in a layout out like a checkerboard, and corridors. The king used the center chamber while the court attendants occupied the other side chambers to protect, assist, and to receive orders. The building rests on top of a tall stone foundation, and a stone deck or veranda locates in front of the building. The noted feature of the building is an absence of a top white roof ridge called yongmaru (Hangul: 용마루) in Korean. Many theories exist to explain the absence, of which a prominent one states that since the king was symbolized as the dragon during the Joseon Dynasty, the yongmaru, which contains the letter dragon or yong (龍), cannot rest on top of the king when he is asleep.